Forensic Multimedia Analysis: Scientists as Stoics? I have made no secret of my academic pursuits. I have been an educator in the classic liberal arts and sciences for some time now. I am of the firm belief that the classics inform every aspect of adult life. I'm one of the few out there that believes that people should not hyper-specialize in their educational pursuits, but should have a broad knowledge set. Save the specialization for doctoral / post-doctoral work. I have also made no secret of my athletic pursuits. The Russian martial art of Sambo has within it a provision of rank that factors not only your competition appearances and wins, but also your reach as a coach. How many people have you assisted in their path to success? The Russian martial art of Systema grounds one in an ethical foundation that effortlessly considers the consequences of action / non-action in everything. This mindfulness becomes a part of taking every breath. To achieve it's goals, Systema seeks to remove the practitioner from the attention of a potential threat, rather than boastfully seeking every violent encounter. My love the many martial systems that I have studied and trained do inform my work as a forensic scientist, as does my love of the classics and the pursuit of knowledge. It's with this in mind that I share this post with you today. I've spent a lot of time traveling this summer. I've been criss-crossing the country spreading the good news of science. I've also been stuck in airports and on the tarmac enduring endless delays. Thankfully, I have a Kindle and can engage in one of my other favorite pursuits, reading. I came across William Ferraiolo, PhD, and his book via a friend on social media. As someone who teaches and lectures on philosophy, religion, and politics, I'm always looking for fresh insight on the classics. 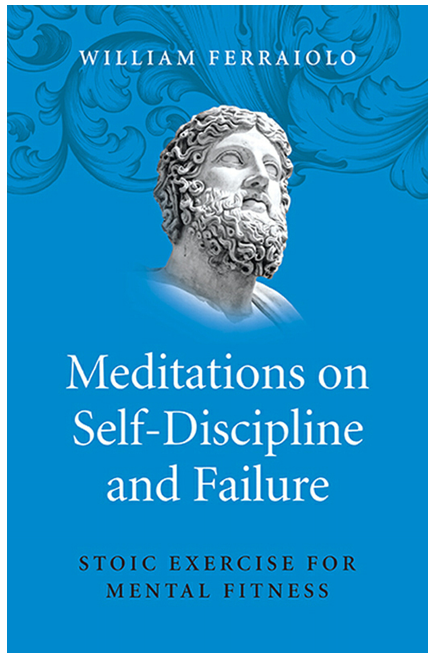 Meditations of Self-Discipline and Failure is just that. It was quite refreshing to read this book, especially in light of the current social media driven culture. Everyone on LinkedIn is an "expert." Everyone on Instagram is a cultural influencer. Everyone on Facebook is having a great time eating every meal at some amazing destination. Real life, I'm afraid, isn't at all like that. I think that so many of the problems that our western culture is facing is due in large part to a loss of our connection with our history. Without a grounding in the classics, without the ability to utilize logic and reason, judging one's own life against what one sees on YouTube will not end well. Sadly, so many seek solace in a bottle or a pill when their life doesn't measure up to what they see on the screen. Tragically, many willingly choose to end their life for similar, trivial reasons. As long as one draws breath, there's always a chance of turning things around for the better. Nothing is ever truly hopeless. I share this tragic fact with my forensic science students: all of the people whom I have known, and who willingly chose to end their lives, have been employed in the forensic sciences. Six of them. That's six too many. I share it with them ahead of informing them of the many ways that they can mitigate the vicarious trauma associated with working in this world - ways that don't include a nightly bottle of Gin. The totality of my life informs my work in the forensic sciences. My knowledge and absorption of stoicism guides my work, reporting style, and testimonial delivery. It also helps me deal with the vile filth and foul of the criminal world. It's not about me, it's about the case, the evidence, and the facts. The case is not about me, and I do not make it so. I do not personalize the case. I do not absorb it - "I worked the ... case." I am a practitioner assisting the Trier of Fact, nothing more. It's about the results, grounded in science and the scientific method. I think others in the sciences would benefit from this approach. 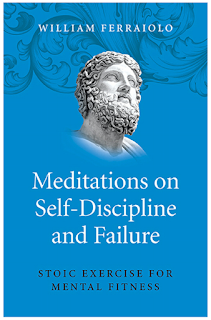 All this being said, I believe Dr. Ferraiolo's Meditations on Self-Discipline and Failure: Stoic Exercise for Mental Fitness, to be a worthwhile read. Here's a quote that fits nicely within this discussion, as well as serving as commentary on recent events. The book is simultaneously easily digested and incredibly disturbing. If one's goal is self-improvement, the improvement of the self will always be a painful slog. No one likes to examine one's own shortcomings and failures. But it is a very necessary pursuit. You'll end up the better for it. This book can serve as a guide to get you started down that vital path of making one's life worth living. Every scientist should be a stoic. I believe stoicism to be an essential characteristic and a necessary defense against error and falsehood. Perhaps you don't agree. Perhaps you don't understand what I mean. If you'd like to know more, start with this book. You'll be glad that you did.